It is 2045. Anyone can cycle in and around Leeds, and feel safe and confident without needing specialist equipment. This is achieved through high quality, appropriate infrastructure which is maintained to a high standard. Journeys including rail and bus are now easy, with either high-quality and -capacity storage on carriages, or bike hire systems at either end of the journey. All road user behaviour is now considerate and appropriate, recognising the relative vulnerabilities of each users. Changes to civil and criminal law support and enforce this behaviour following awareness campaigns and training. Cycling has moved from a positive expression of identity, to a natural choice for getting from A to B. It is a inclusive, fun, easy and attractive option that enhances the well-being of the city. Consideration for cycling is integrated in all aspects of planning processes, supported by public and political opinion which leads to sustained investment. 1 year: A major cycling awareness campaign is completed, focusing on the benefits of cycling and driver behaviour. 2 year: Cycle Superhighway is built to high standard and sets the benchmark for future cycle lanes in Leeds; Greater enforcement of / observance of 20mph. 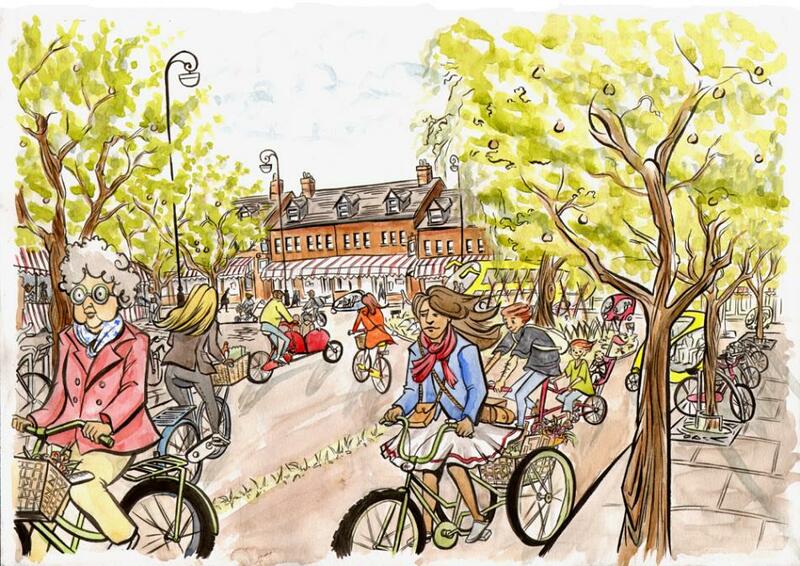 2 – 5 year: Benefits realised from Cycle Superhighway in increased numbers of people cycling. 5 year : New core cycle network routes adopt the standards of the Cycle Superhighway. First excellent solution to a major junction problem is implemented. 10 year: High volume main roads have safe, segregated cycle lanes with fair provision at junctions. Most hot-spot junctions fixed. 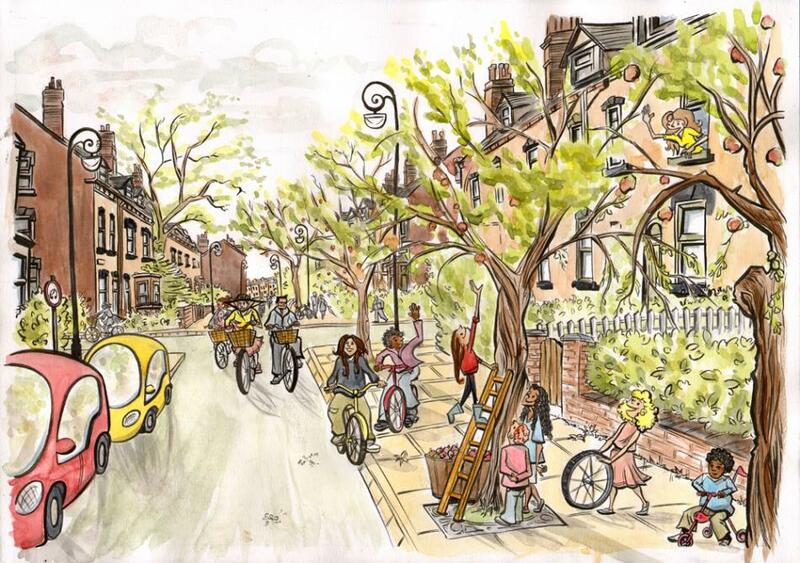 20 year: Anyone can make a door-to-door journey either through calmed residential areas or on high quality cycle lanes. 1 year: Increase in cycle parking provision in Leeds city centre. 2 year : Prominent and attractive large volume cycle parking provided at key locations. Another central cycle hub provides secure staffed parking and 24 hour access. 5 year : Cycle facilities provided by many employers and at key local centres. Use of temporary parking facilities implemented to demonstrate demand and convenience. Council leads on parking and facility provision at its own sites. Trial residential bike storage centre for flats/terraces. 10 year: Some car parking spaces reallocated to bicycle parking in residential areas. High capacity ride-in hub at rail / bus/ arena station with changing facilities and storage. Some high quality facilities provided at mid-size rail stations. Smart cross-city system introduced for access to facilities. 20 year: Ample cycle facilities at most transport hubs, workplaces, local centres and public buildings. Most residential areas have equal volume cycle and vehicle parking. 1 year : Successful cycle hire scheme at many Northern Rail stations implemented. Commitment from DfT on specification of bicycle storage in train design regulations. Improved convenience of getting bicycle on to carriages. 10 year: Better accessibility to platforms for bikes and other users (mobility, luggage) in major stations through provision of lifts, ramps, and wheeling channels. Digital information signage to show where cycles board on trains. Cycle parking at airport. 20 year: Good provision for cycle-rail integration on most routes and at most stations. Cycle hire schemes widely available at public transport hubs. 1 year: Consultation / liaison group formed with the Police. Streamlined system for reporting incidents (with a clear understanding of what to report). Problems with public transport / taxi driving are reported and dealt with effectively. 2 year : Forum with Leeds bus and taxi companies (perhaps facilitated by Metro?) on driver training and awareness. Local campaign for review of presumed liability. 5 year : Major employers in Leeds adopt policies that support safer HGV use. All schools / schoolchildren in Leeds area take cycle training. Review in law over presumed liability (discussion in parliament). Move to wide-view cab designs on HGVs and wider adoption of warning systems for drivers on HGVs and buses. 10 year: Standard cycling segment in driving test which includes practical cycling experience. Significant reduction in HGV-cyclist incidents. 20 year: Majority of road users also make regular cycling journeys. Problems are infrequent and treated as a serious criminal issue. 1 year: Jump in sport and leisure cycle uptake following TdF. Another Leeds mass cycling event using closed roads takes place. 2 year: A full time cycle café opens in Leeds. First Cyclovia. A Leeds City centre cycle race takes place. 5 year: Jump in utility cycling transitioned from TdF legacy. Monthly Cyclovia. Leeds now has established criterium city centre race. 10 year: Cycling is approaching 50:50 gender balance. 20 year: Now common to see children, elderly and people with disabilities cycling. Cycling is approaching an even spread of ages. 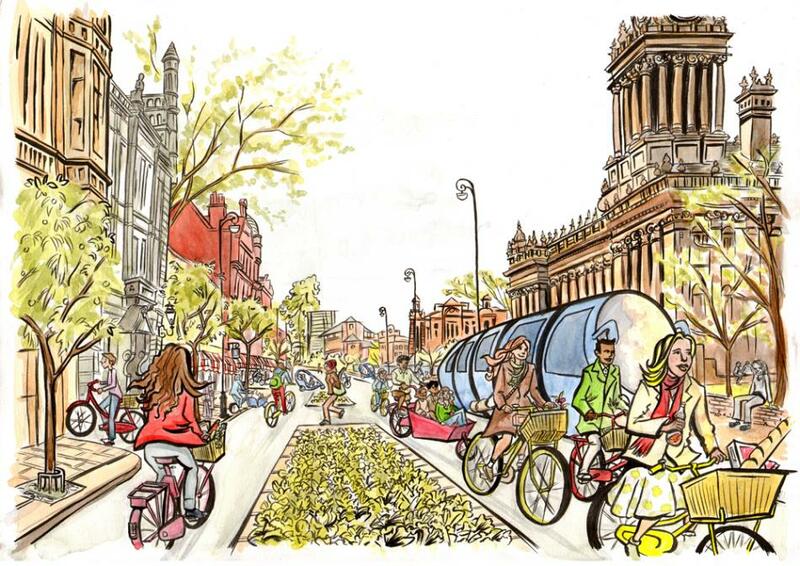 1 year : Leeds City Council cycle strategy published with wide cross-party and public support. West Yorkshire Cycle Prospectus published, encouraging a shift in local authority focus towards cycling. 2 year: Proper enforcement of cycle provision as part of new development planning process. Cycling in all schemes approached / designed to the same high standard. Metro and Leeds City Council commit to significant ongoing investment in cycling of at least £5 per head of population annually. 5 year: Maintenance programmes are used to improve roads and streets for cycling. New major highway schemes make greater provision for cycling. Network of quick win safe cycle greenways completed. 10 year: Cycling provision has equal high priority in new developments with other sustainable transport modes. Cycling policy is established as transport strategy. 20 year: Following policy changes, ingrained understand and expertise in cycling infrastructure has led to a uniform high standard in designs. Ongoing investment in cycling reaches levels comparable with continental cycle-friendly nations.